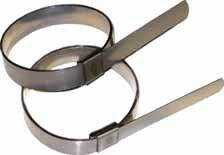 Style F Center Punch Clamp - 5/8in. x .025in. Galvanized steel or Stainless Steel. Only sold in box quantities of 100 per box. Prices are listed per each.